This is an IHRSA featured post, brought to you by EXOS. Knowing your heart rate is so 2010. Today’s wearable fitness technology delivers data points that far exceed anything that’s ever before been made available outside of medical clinics. But what good is all that information if it’s not used to improve health outcomes and fitness levels? When personal trainers and performance coaches are trained in analyzing data from wearable devices, they can provide tremendous benefits to novice and serious clients in reaching their goals. And that means happier members and improved retention. Here are five ways wearables can take fitness training to the next level. Improved recovery. Few elements of fitness success are as important as exercise recovery. Today’s wearables can measure sleep quality, metrics that provide insight on stress loads to different systems in the body, efficiency of regeneration strategies like soft-tissue management programs and other therapies, as well as other important factors that determine what’s going right or wrong in a client’s program. Accurate MAS data. A cornerstone of baseline fitness, the MAS (maximum aerobic test) measures a person’s fitness level in a staged assessment protocol of intervals in two-minute stages. Today’s wearables can provide more accurate numbers to give trainers a clearer picture of their clients’ capabilities. “Energy systems development” optimization. By utilizing MAS results and other data points, you can use wearables to create “energy systems development” zones for clients, which can be used in a variety of ways to optimize performance. Improved individualization. A growing movement in exercise and nutritional science is individualized programs that replace the traditional one-size-fits-all routines. 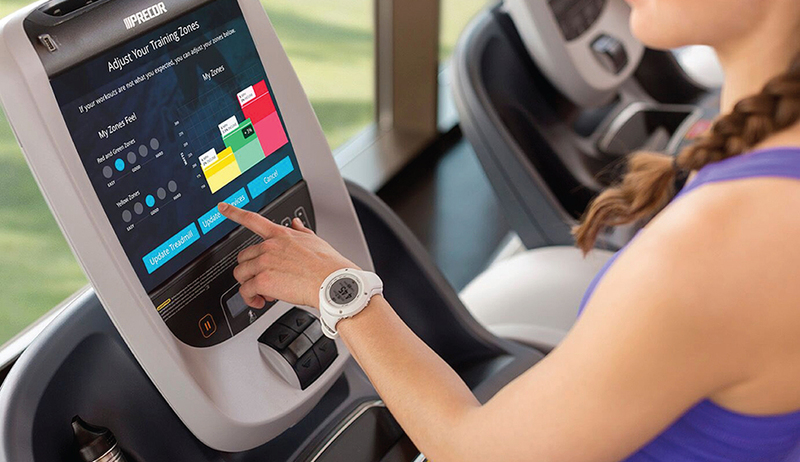 Wearables allow trainers to bring individualization to the health club setting, even for those in group training programs. Improved safety protocols. Part of recovery is knowing when somebody is in a fatigued state or whose vital health markers aren’t where they should be. With data from wearables, well-trained professionals can understand when it’s time to pull back to keep the client safe and healthy. Of course, you won’t get very far if you don’t know how to apply the data from wearables to your clients’ goals. Knowing how to administer the MAS or to create more efficient “energy systems development” programs require specialized training in applying data to individuals. EXOS, a human performance company, realized the great opportunity that fitness wearables created for the fitness industry and got to work on developing education courses for trainers. To do so they teamed up with tech giant Intel to deliver courses that provide expert training using a variety of wearable devices. These courses are geared toward physical therapists, personal trainers, and performance coaches, and cover a wide variety of performance metrics. For a limited time, EXOS is offering a brand-new three-course bundle at a special price. The first course explains how to use data from wearables to help facilitate recovery, the second teaches you how to create “energy systems development” programs that help clients reach their performance potential and the third was created to help fitness professionals make sense of wearable devices and use data to track individual clients’ progress more efficiently even after training sessions end. This improves group training and gives clients personalized experiences more akin to those of private training sessions.